...Yanmar Diesel & Agriculture Solar-Diesel Hybrid Generators Increases Efficiency, Lowers Cost of Gas and Maintenance. Yanmar Diesel has been producing diesel engines since 1933 and today has manufactured over 15 million diesel engines ranging from 4.5 to 5,000 horsepower. Yanmar and Agriculture Solar are proud to be the leading solar-diesel power that helps the world work. Know the dependability and economy of world class power generation. Quiet, safe, clean and ready to use, the Yanmar Diesel and Agriculture Solar series hybrid generator sets are the top-quality, straightforward answer to your power needs. 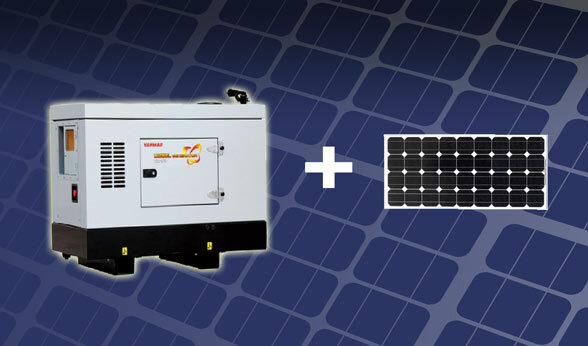 At Agriculture Solar, Yanmar Diesel Hybrid Generators and Agriculture Energies can be your simple solution. Yanmar Diesel and Agriculture Solar have developed a remarkable system through a rigorous process of analysis. It achieves great mixing of solar and fuel that maximizes use and minimizes fuel consumption. The combination of low fuel consumption engines with high-efficiency hybrid power generation makes these quality gensets remarkably cheap to run. Agriculture Energies systems have been successfully active in the top irrigation fields for over 10 years and continues to bring the tried and true principles and advantages of solar hybrid power. Think about it, and then make your move. Let Yanmar Diesel and Agriculture Solar power management provide you with decades of reliability and lasting value. We invite you to explore the possibilities of our reliable hybrid power solutions.